So the Wolseley is almost ready for the paint shop and the vile green colour is being replaced by Olde English white to recreate the two tone colour. For the time being at least. If the car fits into the family and the other half likes it and enjoys driving it then next year I may consider a major overhaul of the front wings and floor pan. The drivers side front wing has had a repair panel fitted at some point and it isn’t the best iv’e come across and the filler work surrounding it is a bit rough. Luckily working in a body shop means I have all the equipment at my disposal to be able to fix it and make it look better. If you don’t then that’s where the cost of owning and working on a classic car can start to put the price up. An hours labour when totalled up can mean the difference between being a nice job and an alright job. The two tone isn’t original but as I’m only changing the sill panels at the moment it will have to do. 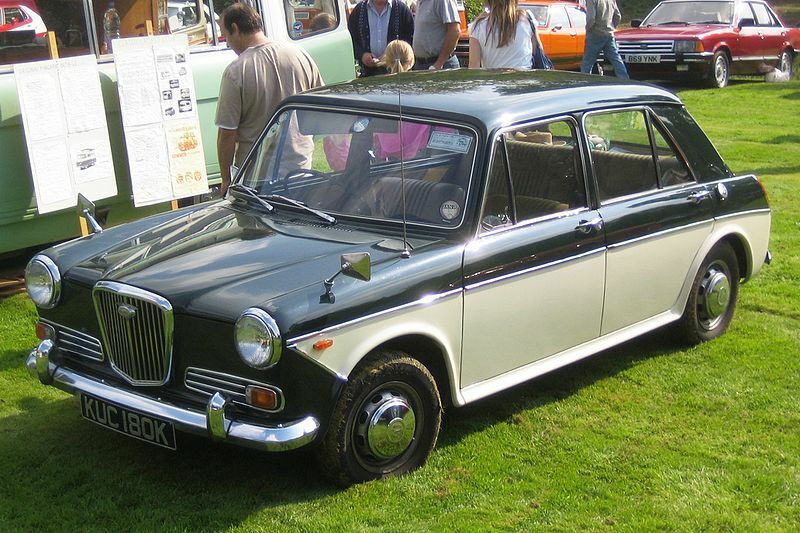 Original Wolseley’s rarely came in two tone and iv’e only seen a few on the web and never seen one in the flesh. If we do end up keeping it and I do fit new wings then the whole car will get a repaint in its original red which will look much nicer. 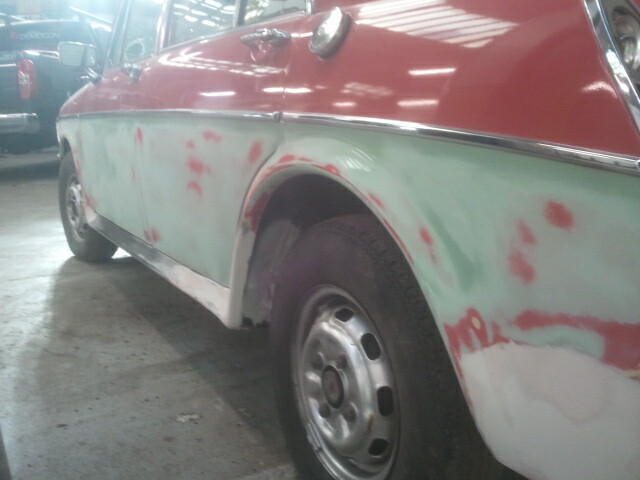 The wheels might get a lick of paint too just to freshen the look up and make it look cleaner. 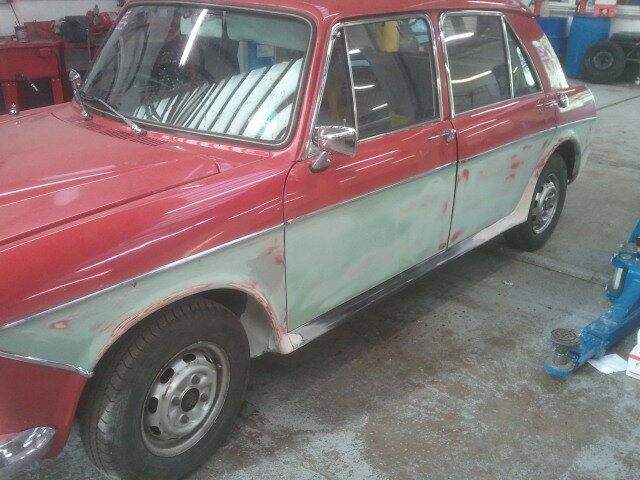 nobody wants to see rust when you have shiny paintwork do they. From reading the paperwork it seems to have been owned by a few elderly ladies so I think the poor repairs it has had are down to the local friendly mechanic who just tried to keep it on the road for them therefore repairs were done as cheaply and effectively as possible. Which is never good as you or inevitably someone else ends up doing it again and again. Be it bodywork or suspension stuff you should always do it properly and pay out what you can afford for the best you can get. Don’t be fooled by cheap imitation parts or panels from your local car spares shop as some are plain nasty and might not even last from one MOT to the other. Sometimes second hand stuff from a breaker can be better than a cheap replacement. A lot of car spares places do Lemforder stuff which is generally top notch and in some instances the same as OEM just in a different box or packaging so shop around and if something is too cheap have a think why. The ADO16 was the factory name for the car. Amalgamated Drawing Office Project 16. It was one of Britain’s best selling cars and the amount of times iv’e had people say we had one of them is just unbelievable. I think ever household in the country has seen one parked outside at some point. 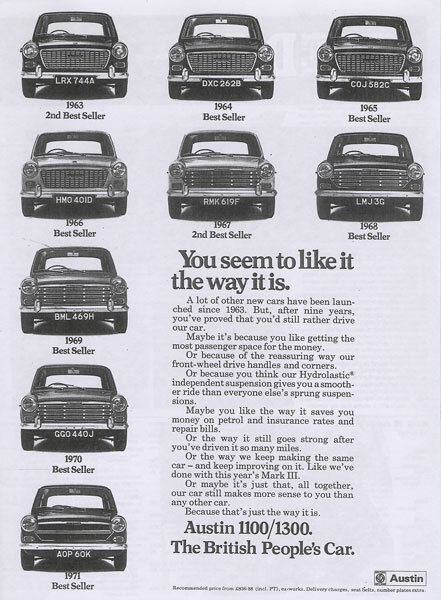 A useable family car that could easily fit a family of four in it and with a boot big enough for the shopping or suitcases its easy to understand why it was so popular and available in all colours and various guises Wolseley, Riley, Vanden Plas, Morris and Austin it was always going to sell well. Only the evolution of time and newer better equipped and built cars put pay to it.